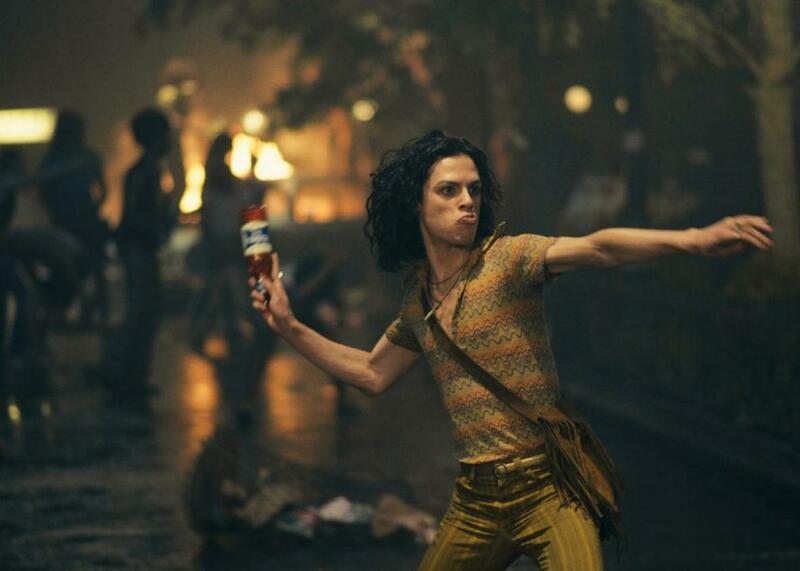 Stonewall and LGBTQ homelessness: Roland Emmerich’s movie got one thing right. Jonny Beauchamp as street kid Ray/Ramona in Stonewall. Roland Emmerich’s Stonewall, a fictionalized retelling of the June 1969 riots in New York widely credited with launching the “pride” phase of the LGBTQ civil rights movement, received blistering reviews, squeezed out barely a drop in the box-office bucket, and left town (or at least my town) virtually unnoticed. While movie critics lambasted the scattered and flat filmmaking and the sometimes trite writing with its white liberal platitudes, LGBTQ activists called out the downplaying or outright erasure of queer people of color from the narrative, largely through the focus on Danny, a fictional strapping white boy from Indiana in whose hands Emmerich places the “first brick.” With all this criticism you have to wonder, is there anything at all redeeming about the film? What, if anything, does Stonewall get right? While the outrage is largely deserved, the movie deserves a note of praise for one element that’s been lost in the fray: the portrayal of LGBTQ youth experiencing homelessness. Bill McDermott, chief development officer at the Los Angeles LGBT Center and former director of development for the Stonewall Community Foundation, said he was moved by the hardships youths like Ray/Ramona, Cong, and Orphan Annie faced. (It’s worth noting that Emmerich himself said queer youth homelessness was part of why he made the film.) Tommy Lanigan-Schmidt, who was a homeless youth and participated in the Stonewall rebellion, said the movie was fairly accurate in terms of LGBTQ homeless youth being the main engine behind the movement. The portrayal throughout the movie of the abuses the young people suffered at the hands of almost everyone—parents, police, bar owners and employees, vindictive johns—made their rage palpable and gave context to the pressures that lead up to the riots. With all the advancements the LGBTQ movement has made in recent years—from marriage equality to queer-identified officers being able to serve openly in the military—the indignities depicted in the movie may feel like a history lesson to some. Yet the youth experience portrayed in Stonewall—the rejection, abuse, racism, oppression, and hatred—is still commonplace for an overwhelming number of LGBTQ youth today. A staggering 40 percent of all homeless youth in the United States identify as LGBTQ and yet make up only 6 percent of the general population; a disproportionately high number of those are youth of color. There is a paucity of services for these youth—and of the LGBTQ youth services that do exist, few work in homelessness prevention. The causes of LGBTQ youth homelessness are varied, ranging from economic hardship to systemic oppression to mental health issues, as well as family conflict. These youth are unquestionably vulnerable. Leaving home because of family rejection is the greatest predictor of future involvement with the juvenile justice system for LGBTQ youth. What’s worse, queer-identified youth utilizing general population homeless services often face further discrimination, violence, and abuse. Many feel safer on the streets than in a shelter. The statistics for transgender youth are especially devastating, with 1-in-5 having experienced homelessness at some time in their lives because of discrimination and family rejection. Transgender people facing housing instability, and they also face discrimination from agencies designed to help young people. Nearly 1-in-3 trans youths have reported being turned away from a shelter due to their gender identity. What’s lost in the Stonewall critique is that the indignities experienced by LGBTQ youth in the 1960s are virtually the same as today. Despite the shifting tides of political and social acceptance for certain segments of the community, LGBTQ youth continue to suffer the burden of social stigma and are continually denied their dignity. This should enrage us. As a community, when we remain silent to the indignities LGBTQ youth battle daily, we become complicit in their mistreatment. What Stonewall got right was that LGBTQ homeless youth deserve our attention. We need to ignite a conversation about caring across differences; we need to mobilize around this issue with the same ingenuity and tenacity that brought us the right to marry. We must build on that momentum and prove to the youth that our shared humanity unites us. They deserve at least that much.